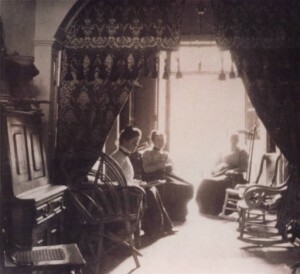 Three generations in Fish parlor, 1902: Clara Fish, Maria Wakefield Fish, Clarina Brown Wakefield. American Association of University Women Tucson Branch Archives: Collegiate Club of Tucson in Arizona Historical Society MS689, Box 2, F 8 includes: Minutes September 1922/ May 1923 article by Clara Roberts, branch historian/Political Meeting article by Mrs. Fish (ca. 1913-15). “The Convention.” 19 September 1891. 2 Mar 1913: Sunday Society page. 9 Mar 1913: Sunday Society page. “House agrees to original bill.” 13 March 1913,Thursday. “First woman registers to vote.” 16 March 1913, Sunday: Section 1. “Collegiate Club Holds Important Meeting.” 13 April 1913, Sunday Society Page: Section 2, p.1. “Mere Woman Registers.” 20 April 1913, Sunday Society Page (Collegiate Club). Buehman, Albert R., ed. “Arizona Album” clipping from Citizen 1 Mar 1959 in Arizona Historical Society, Tucson, AZ. MS____ Box 3 Folder 13. “Clara Fish Roberts Recalls Eventful Life”. Tucson Daily Citizen, 17 November 1960. “Clara Fish Roberts”, Women’s Plaza of Honor 24 Oct 2006. “Collegiate Club of Tucson” from Arizona Historical Society, Tucson, AZ. MS689, Box 2, F 8. Fly Project probably a coalition with Cooperative . Extension, Clara committee chair, 1926 still called Collegiate Club of Tucson; 1920 $2/year dues; Collegiate Club Diner ticket. D. A. R., P. E. O. and George Washington Bi-Centennial Committee Articles in Arizona Historical Society in Bio Clipping Notebook #538. Delta Kappa Gamma articles in Arizona Historical Society in Bio Clipping Notebook #538. “First Student to Write Name Upon Register [L]ives History”, p. 1 and p. 2. The Tucson Citizen, 18 March 1923. Arizona Historical Society Bio Clipping Notebook #538. League of Woman Voters. Arizona Historical Society, Tucson, AZ. MS689, Box 2, F 8. Clara President 1926; 1919-1938 lists members; minutes 1922-1925. “Letter for Clara Fish, the UA’s first Student.” The University of Arizona Celebrates 125 Years. Mexican fishing trip article in Arizona Historical Society in Bio Clipping Notebook #538. Mitchell, Margaret “Oral History Interview of Virginia Roberts Flaccus.” Arizona Historical Society, Tucson. 25 April 1984. Call number AV0395. “Mrs. F. C. Roberts First Student to Register at University of Arizona on Its Opening Day, October 1, 1891.” [may be from Arizona Daily Star], 25 November 1926. Arizona Historical Society in Bio Clipping Notebook #538. “Mrs. Roberts to be Speaker Friday at Ladies’ Day.” The Tucson Citizen, 31 January 1940. Arizona Historical Society Bio Clipping Notebook #538. “Oldest Grads Are Honored Speakers.” [may be from Arizona Daily Star], 9 September 1941. Arizona Historical Society Bio Clipping Notebook #538. Roberts, Clara. Maria Wakefield Fish biography notes. Arizona Historical Society, Tucson. AZ. MS689, Box 1, F 1 (autograph books 1884; 1888-96). Ross, Margaret Wheeler. “The Oldest Woman’s Club in Arizona.” Arizona: The State, pp 5-16, Oct 1916. “Tucson Unified School District History: The First Hundred Years” (December 2011).